Who doesn’t like free stuff? Simple ideas you can take and use right away. 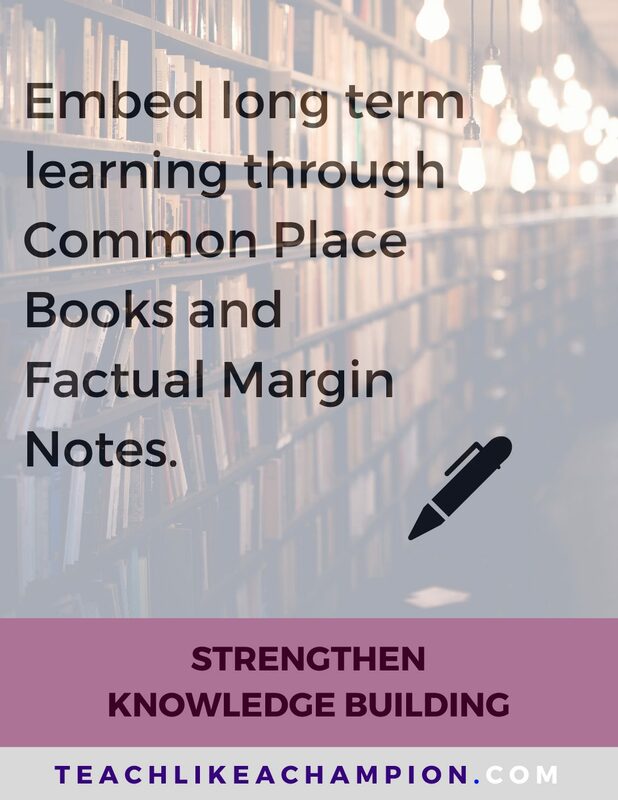 Embed long term learning through Common Place Books and Factual Margin Notes. Use the dropdowns below to find and download resources we've previously posted. 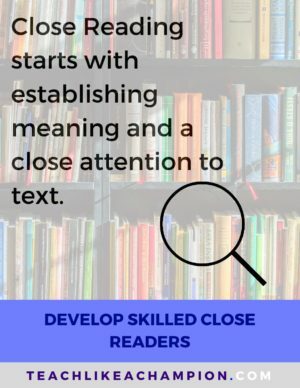 Close Reading starts with establishing meaning and a close attention to text. 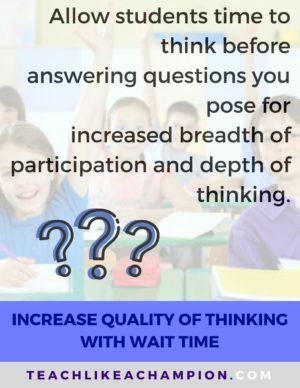 Allow students time to think before answering questions you pose for increased breadth of participation and depth of thinking. 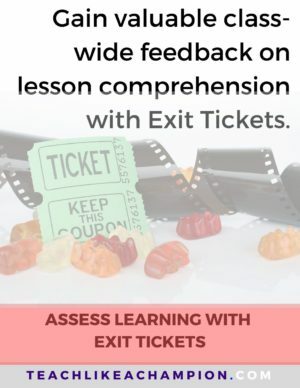 Gain valuable class-wide feedback on lesson comprehension with Exit Tickets. 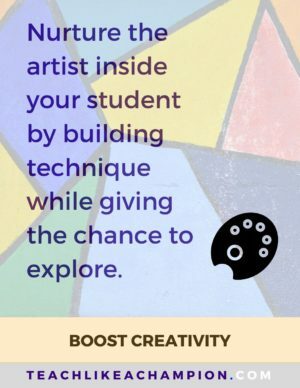 Nurture the artist inside your student by building technique while giving the chance to explore. 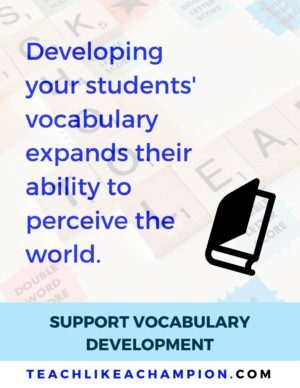 Use a variety of different methods to expand and support the vocabulary development of your students. 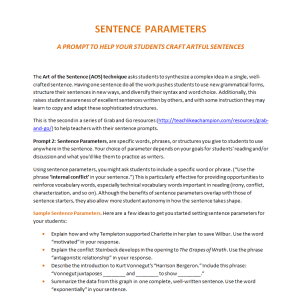 Use sentence level revision to strengthen student syntactical control, which will make your students better writers regardless of the type of writing they undertake. 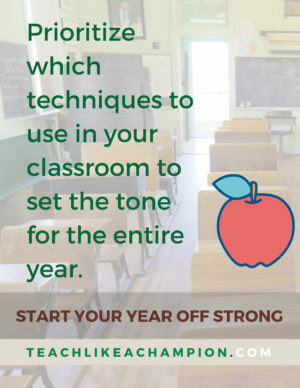 Prioritize which techniques to use in your classroom to set the tone for the entire year. 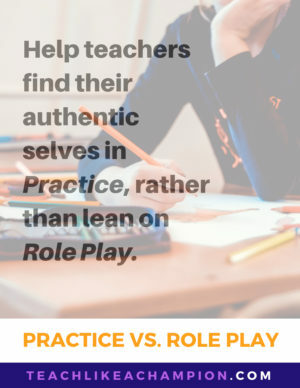 Guide teachers to finding their authentic teaching voice through Practice vs. Role Play: leaning on what works for other teachers. 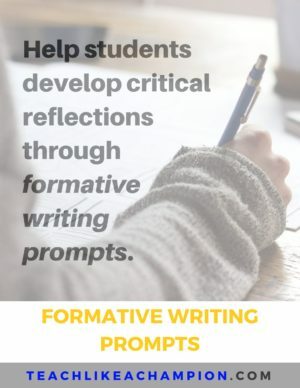 Develop reflective and critical thinking skills in your students by using formative writing prompts in all curricular areas. 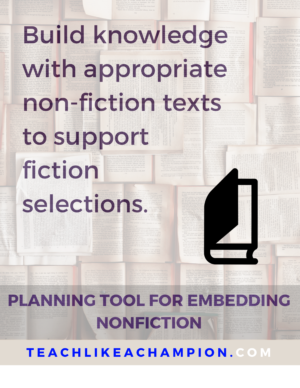 Build knowledge with appropriate non-fiction texts to support fiction selections. 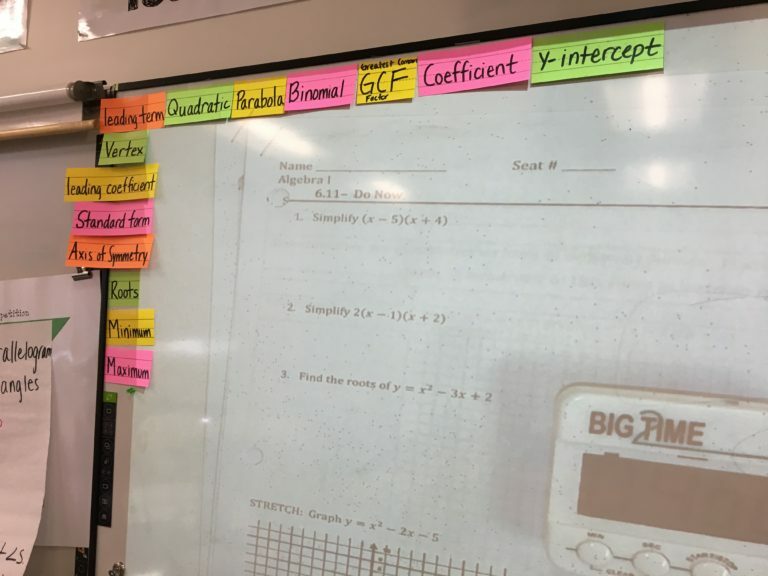 Turn an "I don't know" into an opportunity by ensuring that students who won't try or can't answer practice getting it right. 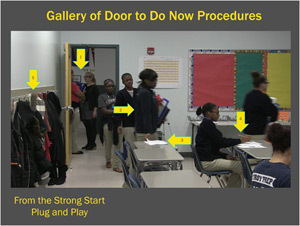 Start your teaching day off right with a Do Now ready for your students as soon as they walk in the door. Use this checklist to remind yourself of best practices and these resources to help craft relevant, sharp Do Nows. 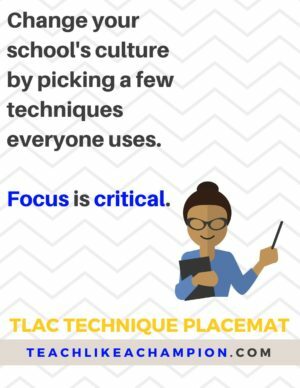 Use this placemat to help teachers remember and organize the TLAC techniques in the classroom. Prioritize which techniques will be implemented by everyone. 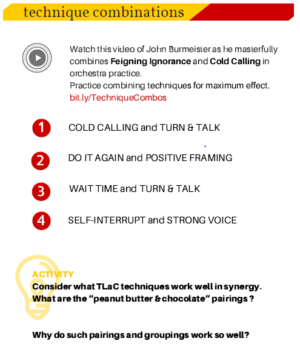 A video and activity to analyze successful Teach Like a Champion technique combinations. 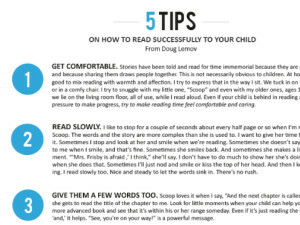 Everyone knows the importance of reading aloud to children, but it can be a daunting task for a lot of parents. Here are some pointers that can help put parents at ease and make it an enjoyable experience that both parent and child can look forward to. Here's an infographic to keep in your top drawer. Peek at it the next time you (or the first year teacher across the hall) could use a little classroom pick-me-up. 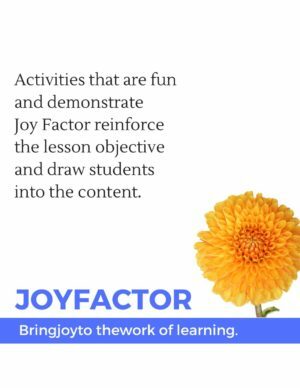 Make these Joy Factor activities your own! 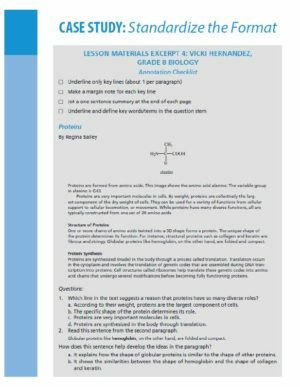 Check out this everyday reading response template to help build student comprehension and attentiveness to critical portions of text. 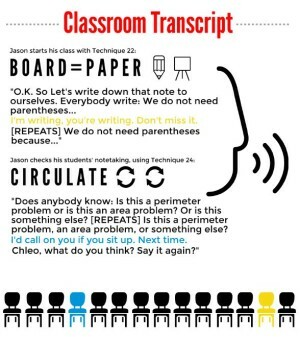 It’s an excellent tool for daily Close Reading. 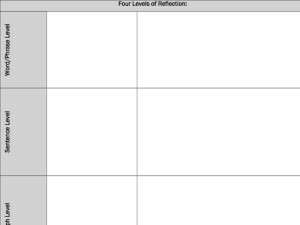 With this template students will practice some key Close Reading skills and, because it’s so easily reused every day, they’ll practice them regularly. 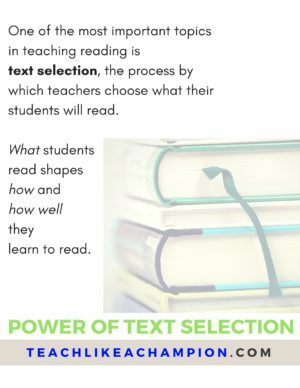 This is important as we give students more and more opportunities to close read on their own, or “Solo” as it’s called in our forthcoming book, Reading Reconsidered (due out in February and ready for pre-order now). Download the tool by clicking on the Download button, and read more about how to use the tool in this blog post. 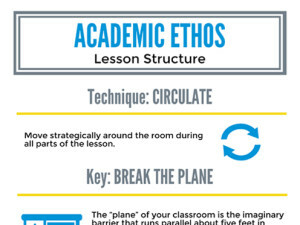 Here’s a printable infographic to keep at your desk or at the ready (for when that new teacher next door approaches you for concrete advice)! Circulate is a powerful way to engage students using the tools of affirmation and accountability. 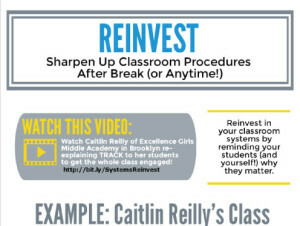 Here’s a printable infographic to keep at your desk or at the ready (for when that new teacher next door approaches you for concrete advice)! 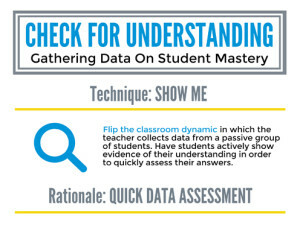 Show Me is a powerful way to check for understanding and also: to gather data on student mastery. Class discussions are at their best and most effective when every student actively participates. 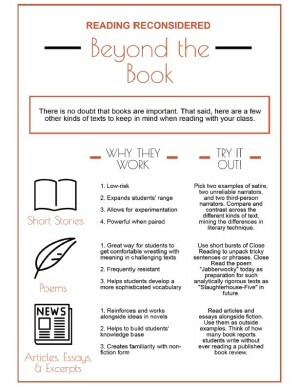 This Grab & Go provides two infographics that breakdown the “STAR/SLANT” and ”Everybody Writes” techniques from Teach Like a Champion 2.0 – print them out and keep on your desk as a nice reminder of ways to keep your students engaged in academic content. 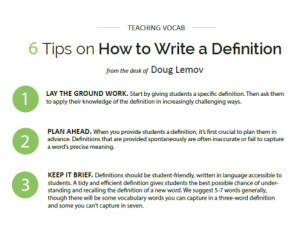 Crafting definitions that are both accurate and student-friendly is one of the most challenging and overlooked aspects of vocabulary instruction. 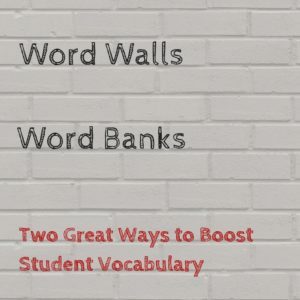 This Grab and Go provides six tips to create definitions that are useful, accessible, and accurate. Giving students time to think before answering questions encourages a higher-quality initial answer instead of the first answer a student can think of. 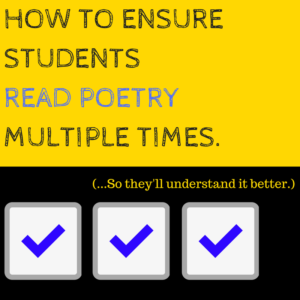 Also, there are several steps necessary to teach and remind your students to use their Wait Time effectively. 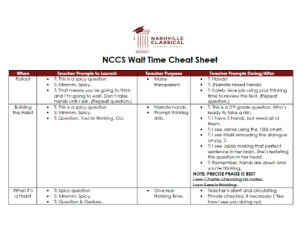 Charlie Friedman, principal of Nashville Classical Charter School, created a Wait Time Cheat Sheet after noticing that teachers on his team struggled to make Wait Time transparent. 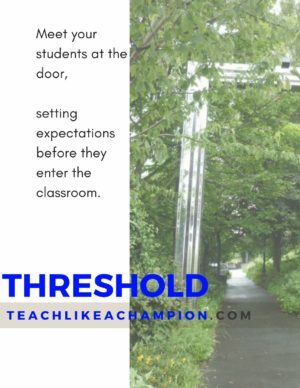 One consistency among champion teachers is their vigilance in maintaining the expectation that it’s not OK not to try. 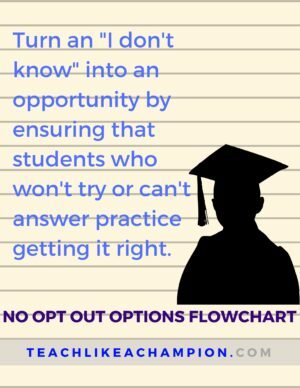 One key step in the process is eliminating the option for students of "opting out": muttering "I don’t know" or shrugging impassively when asked a question. How a teacher chooses to respond to a student’s “I don’t know” can be pivotal in the life of a classroom. 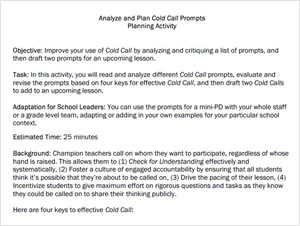 This month’s Grab and Go resource provides ideas for how to respond effectively. 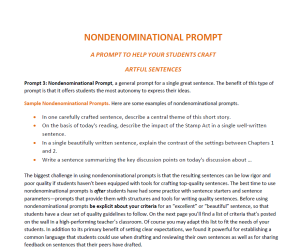 Adding Everybody Writes to your lesson is one of the best ways to instantly boost rigor in your classroom. 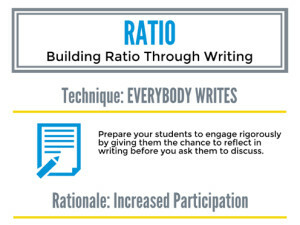 For students to reap the full rewards of this technique, they need to be writing the entire time. 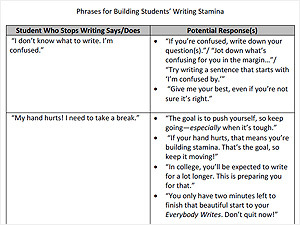 This Grab and Go resource helps you anticipate common expressions of struggle – “I’m not sure what to write,” or “I’m already done,” for example– and equips you with at-the-ready phrases to prompt students to continue writing. 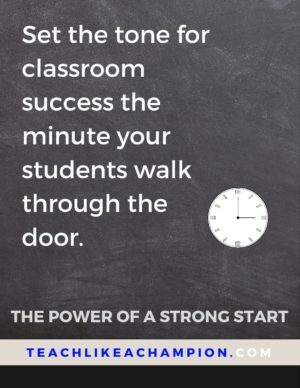 When your students return in the fall, you’ll be concentrating in the first weeks on establishing a positive, engaging, productive academic culture. 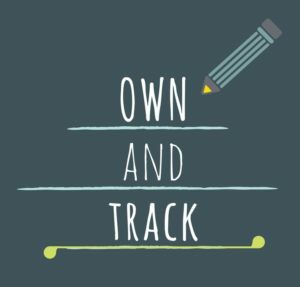 One technique teachers use to inject energy, maintain focus, emphasize key words or ideas, and support clarity of directions is Call and Response. 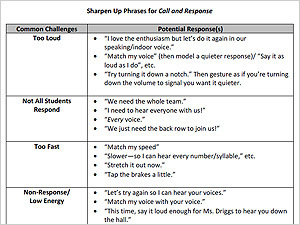 With Call and Response, the teacher gives a clear cue (verbal and/or nonverbal), and the entire class responds in unison. As Doug has described frequently in the blog and forthcoming in Chapter 2 of Teach Like a Champion 2.0, your ability to effectively Check For Understanding largely depends on whether or not, you, the teacher, have established a strong Culture of Error—an environment where students feel safe revealing and learning from their mistakes. 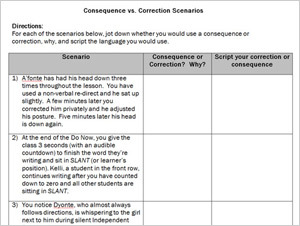 One of the most effective ways to build this kind of culture is by intentionally planning out what you’ll say to students during your lessons—especially when they make mistakes or take academic risks. Inevitably at our workshops, we have more content than we can get to. 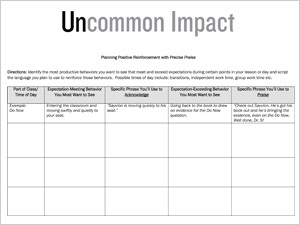 Here’s a simple, powerful planning activity that all teachers can use to increase students’ consistency with and eagerness to meet and exceed expectations. 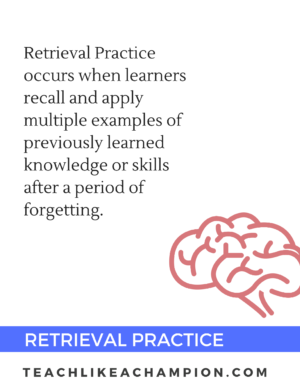 Naming the specific actions a student is taking helps the student to replicate that action in the future and guides others for what to do as well. 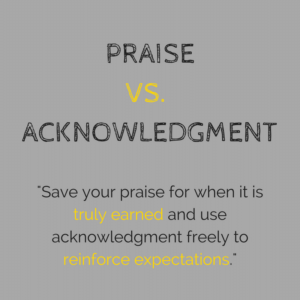 Precise Praise teaches and motivates. Bonus! This works for spouses and your own kids too. 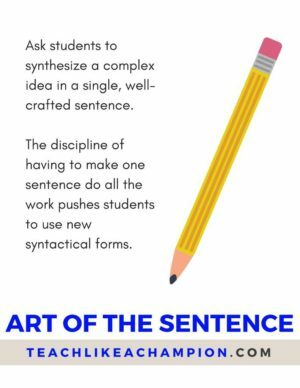 What to Do means giving students specific, concrete, observable directions—in sequence—to tell them What to Do, as opposed to what NOT to do. 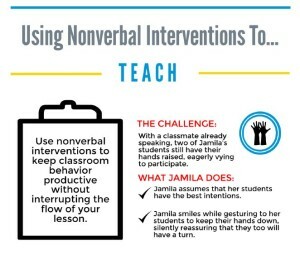 Although often used to help students meet high behavioral expectations, What to Do is also an important tool for supporting students’ academic behaviors. 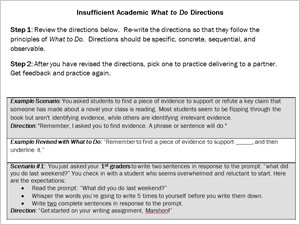 Use the attached worksheet to identify opportunities to clarify and sharpen your expectations for academic tasks when you see students struggling. 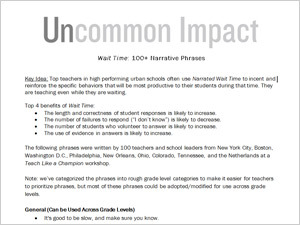 Top teachers in high performing urban schools often use Narrated Wait Time to incent and reinforce the specific behaviors that will be most productive to their students during that time. They are teaching even while they are waiting. Here are 100 phrases written by 100 teachers and school leaders at a Teach Like a Champion workshop. 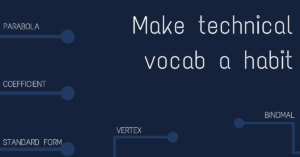 Ensure you’ll use one or two of these phrases by scripting them into an upcoming lesson plan. 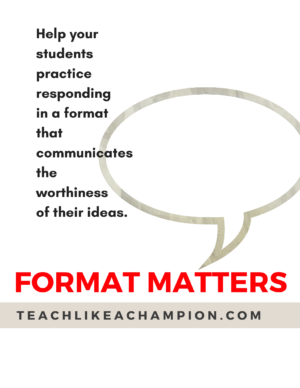 What’s that finger-snapping you’re seeing in a Teach Like a Champion video clip—as the class snaps a couple of snaps as one student strives to answer a challenging question? An example of a Prop! Props are a form of public praise for students who demonstrate excellence or exemplify virtues. 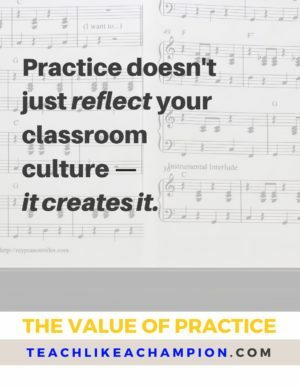 Build a culture that valorizes achievement and effort in your class (and do it without sacrificing order of "time on task"). This month’s download is a quick cheat sheet of Props. 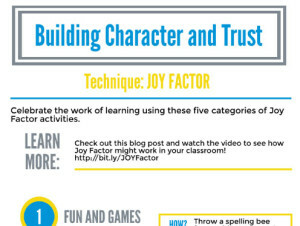 Borrow or adapt from this list of tried-and-true to add joy to any lesson. Last April, the TLAC team visited California where we spent two days with Aspire Public Schools. 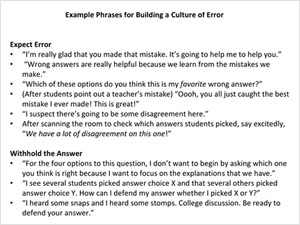 We worked on creating a strong Culture of Error – a classroom environment that is strategically engineered to encourage students to take academic risks in order to uncover and correct misunderstandings. 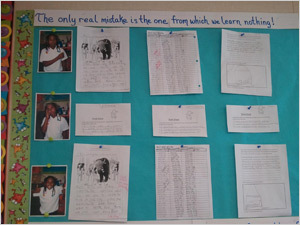 Michelle Flores sent us a picture of a bulletin board in her classroom that she uses to celebrate students who make and then learn from their mistakes. Thank you, Michelle and Aspire!